Description: Cream colored blend with many tiny, green leaves throughout. Strong cucumber aroma/flavor with creamy dairy back notes. Usage: Blend 2 tablespoons mix into 1 1/2 cups sour cream and 1/2 cup mayonnaise; or to taste. Refrigerate for 1 hour to intensify flavor. 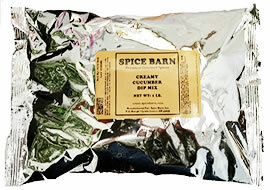 Variation: Add 1 1/2 teaspoons Spice Barn dried dill weed to the above mixture for a Cool Cucumber Dill Dip! Ingredients: Sugar, Salt, Maltodextrin, Natural and Artificial Flavors including Cream, Buttermilk Powder, Onion, Vinegar Powder (maltodextrin, white distilled vinegar, modified food starch), Citric Acid, Sodium Diacetate, Parsley, less than 2% Silicon Dioxide added to prevent caking.